In my last entry I compared the frequencies of my two 10 MHz frequency references. One is from FEI FE-5680A Rubidium Frequency Standard (RFS) and the other one is from Trimble Thunderbolt GPS Disciplined Oscillator (GPSDO). The frequency accuracy of GPSDO, on the other hand, does not drift with time. This is because the guys at the U.S. Naval Observatory (USNO) continuously monitor and correct the clocks in their GPS satellites to track UTC(USNO). The UTC(USNO) in turns tracks the Coordinated Universal Time (UTC) time maintained by BIPM in Paris. 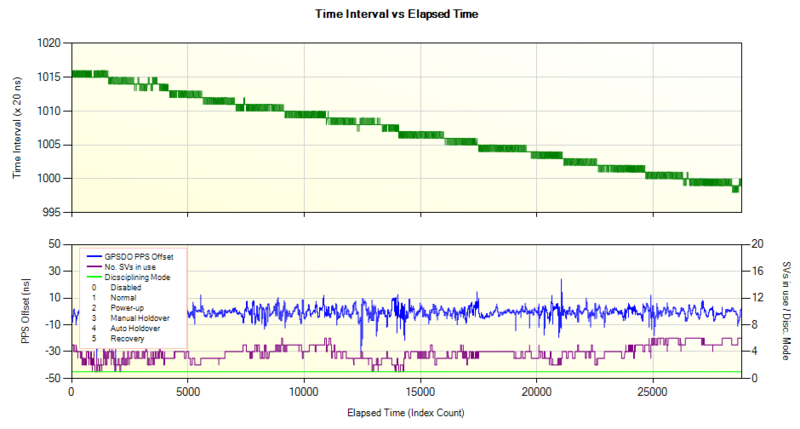 The top graph shows the time interval measured. The horizontal axis is the elapsed time. Each sample point correspond to 1 second. Over a period of 8.3 hours, the PPS signal of the RFS drifted by 320 ns. This drift corresponds to an error of 1.1×10-11 or 0.00011 Hz. The bottom graph plots the self-monitoring performance of the GPSDO. It shows that the GPSDO is functioning correctly during the duration of the experiment. Next: improve the resolution of my counter. Short of buying Stanford Research SR620 counter, I’m planning to add a linear interpolator to my digital counter. Basically it will use the rise time of an RC circuit to measure time in-between the counter oscillator “ticks”. Next: Understand time stablitity measurement, also known as Allan Deviation. This entry was posted in Electronics, Time Nuts on April 25, 2013 by stephen. Here is a quick frequency comparison between my atomic clock against my GPS disciplined oscillator (GPSDO). I am using Trimble Thunderbolt as my reference GPSDO. GPSDO is basically an ovenized crystal that is steered/disciplined to GPS time. The GPS time itself is steered to UTC(USNO). In short, GPSDO produces accurate frequency reference with zero long term frequency drift. The video below shows that the 10 MHz frequency signal from the Rubidium Frequency Standard is virtually identical to the GPSDO signal. Later I will perform a more in-depth comparison between the two clocks. This entry was posted in Time Nuts on July 18, 2012 by stephen.